In the evening of August 4, 2016, Princess Sofia of Sweden attended a dinner held for the benefit of "Project Playground" in Norrviken Gardens of Bastad city on the Industry Day held by Granslösa Möten organization ( Here ). At the charity dinner, Princess Sofia wore a cosmic-cobalt coloured Cynthia jumpsuit by Diana Von Furstenberg (DVF). 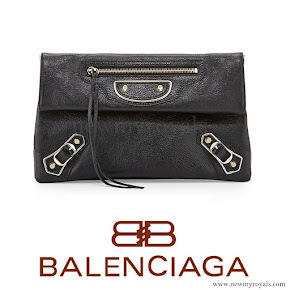 The Princess completed her outfit with a Stina black suede shoe by Swedish brand Stinaa.j and a black classic envelope handbag by Balenciaga brand. Her earrings were by Georg Jensen. I love the color. I do not like this on her. Maybe it is the angle of the photo. Need to see from front . I think she looks youthful and vibrant. I hate that color, maybe because it would be the very worst color to my own complex. It is not becoming to Sofia either. The very kind of dress that looks barely tolerable on the model and... well, let's not even comment on how it looks on Sofia. Also, this could be a nice colour but the massive head to toe attack of this electric shade is way too offensive for the eye. No, no, no. Sofia needs a mirrow,a big one!She will never have style.